On your average morning – like this morning – I make myself a pot of coffee. The pot is thermal. The coffee is Starbucks Sumatra, but at about half the recommended potency. I will drink between one and three of these pots a day. On a work morning, I make my pot, give my husband a teeny cup, then fill a 16 oz mug and a 16 oz thermos. During one summer job during college, my commute was so long I made a 16 oz mug, a 16 oz thermal mug and a 16 oz thermos and would have all of it consumed by the time I got to work. During college – at which time you could tell my relative poverty by the fact I was drinking Maxwell House (although I would cut it with Starbucks if I could get any) – I used to store my coffee cup in my coat pocket. For one class, I’d have my 16 oz mug, my 16 oz thermos and a 16 oz mug for a friend in my pocket. I was a good friend. This might be my very favorite coffee mug (although the one with the dancing skeletons I use during Halloween is a close second). Starbucks used to make these mugs all the time. They were all the same basic design, but with different pictures. I have an impressionist one, a red hispanic themed one, the aforementioned dancing skeletons… I had an extensive collection. They cost five or six dollars and came with a free drink. (For reference, my current drink costs $4.44 so that would be an excellent deal for me. Plus it’s $.10 off every drink you get in your own mug!) It’s a good thing I did since five or six years ago (more? ), they stopped making them. They branched out to different designs – every mug having a different profile. They’ve innovated themselves out of something I loved! The back of the mug, with the Space Needle in the background. 1997 represents the period where Starbucks was just beginning to explode as a global company, but was still strongly rooted in Seattle. Right now Starbucks is basically only offering stainless steel travel mugs, to my sorrow. My problem with that is that I drink my coffee black. I pour it the second it comes out of my Mr. Coffee (not because I’m a purist – because I’m late for work). So it’s near boiling when I put it in my stainless steel mug. It stays near boiling for a looooooong time. I’m guessing the people who love these mugs add milk or creamer so they don’t burn their tongues off. Which brings me to my last idiosyncrasy (I swear, half of my externally visible oddness has to do with my coffee habits…) I drink my coffee from these travel mugs with a straw. Always have. I learned to drink coffee and to drive at literally the same time. (Coincidence? I think not.) When I fell in love with java was when I was putting nearly a thousand miles EVERY WEEK on my parents car. (Loving parents!) I was in the car 2 to 3 hours a day, every day. Maybe more. Often first thing in the morning. If you drink out of a mug regularly in the car, you have to tilt your head back to finish it (briefly taking your eyes off the road). You also have to be more coordinated than I am, or you spill coffee on yourself. (Personally, I consider au de caffeine my personal perfume.) I neatly solved both of these problems by grabbing a straw from Starbucks and using it in mug until it breaks. In a positive innovation, Starbucks has recently started selling durable straws (for use in their cold beverages, they claim) which do not break. This is a bonus. When I’m home, as I am today, I prefer my coffee in a non travel mug. (At which time I do not use a straw, if you’re curious.) I’d never had quite a favorite, until about a year ago. I inherited a few small things from my paternal grandparents. Some pieces of jewelry. The melamine plates and bowls my grandma served me cookies on. 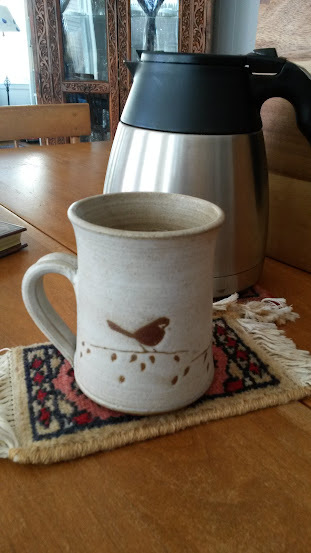 A handthrown clay coffee mug with birds. 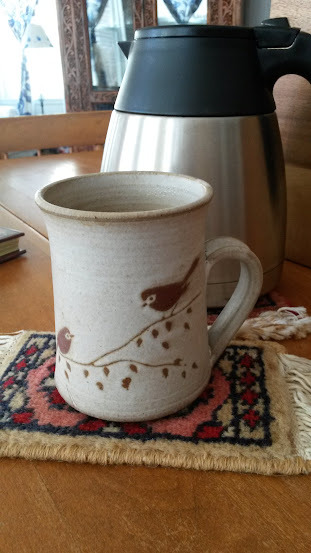 I particularly like how the birds are actually etched into the pottery. You can feel the design with your fingers. I bet this mug would be lovely to a blind person too. I don’t know why I like it so much. I’m not even – on calm reflection – sure how I know it came from my grandma. (Relatives, can anyone confirm, or remember it?) But it’s perfect. It’s warm to the hands, but doesn’t lose heat too quickly, or scald. It conforms perfectly to the proportions of my hand. It holds just the right amount of coffee for consuming at my pace without getting cold. And the three birds on it look cheerful. 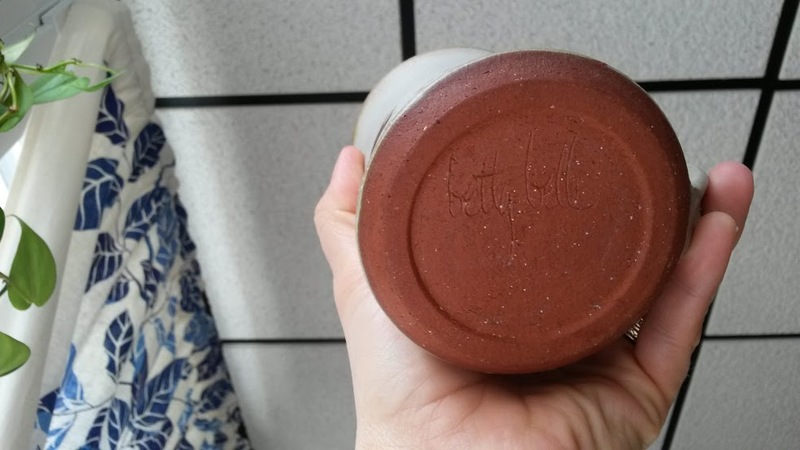 There’s a name of the artist neatly signed on the bottom in bell hook-esque cursive: “betty belle”. It’s as though the fifties blew me a kiss in the shape of a coffee cup. I love it. One of the great curses of using beautiful objects is that they are exposed to risk in the use. That platonic ideal Starbucks mug hasn’t held coffee in over 10 years because it has a crack. If I put coffee in it, that design will be gone forever. I suppose I should just throw it away, but I don’t want to. Wandering around the house doing chores in my slippers – one day I’ll move wrong and drop my grandmother’s mug and it will shatter. It is pottery, thrown and designed by hand. It is breakable. I will mourn, but I’ll have the memory of a hundred hot cups to console me. I’ll take the great memories of a mug loved and lost over an intact cup in the back of my cupboard any day of the week. I’ve Googled betty belle and come up with nothing. I like to imagine she was a Boeing housewife who did pottery in her spare time to supplement her income. She was almost certainly a Seattle area artist. What’s your favorite coffee cup? What’s that object you touch every day that brings you pleasure every time you use it?